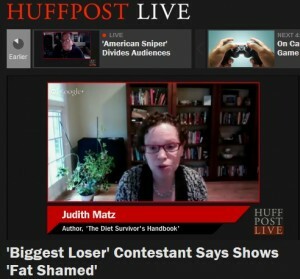 Judith Matz on Huffington Post Live. Former “The Biggest Loser” contestant Kai Hibbard has complained producers on the long-running reality series are physically and mentally abusive, making contestants exercise long hours to rapidly lose weight. Matz said it is more important for people to develop healthy eating and living habits. And healthy people can also come in all shapes and sizes, not just thin, she said. Matz and other social work experts talked about weight reality shows in this SocialWorkersSpeak.org feature article from 2010 and California social worker Shay Sorrells was a popular guest on the program and talked to social workers about healthy eating in this article from 2010. To find more social work experts such as Matz who can comment on issues such as health care, veterans affairs, child welfare and mental health visit the National Association of Social Workers’ 1,000 Experts Campaign. Shame is the last thing that those who are overweight need to feel. People whose weight has become a physical and psychological danger need to feed themselves with love and acceptance while maintaining a healthy discipline over their inner child, who constantly cries for more. Part of the success of the Biggest Loser’s contestants, though, is just the change in routine that breaks bad eating habits. If mental and emotional healing do not take place, the old habits reassert themselves when the contestants return home.